"Portland City Hall, 1868 - 1908." Portland City Hall, 1868 - 1908. 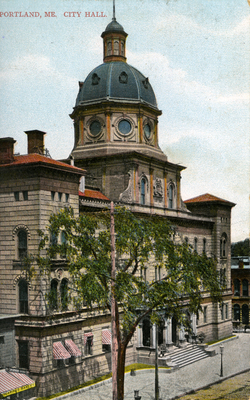 Vertical, high-angle view of Portland City Hall, built in 1868 and burned on 24 January 1908. "Portland City Hall, 1868 - 1908." (2017). Portland Postcards. 33. Portland City Hall, Portland, Me.